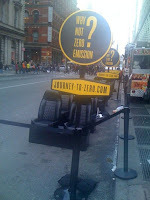 With Day Two of the New York Auto Show, there were a couple of public street installations out in New York. 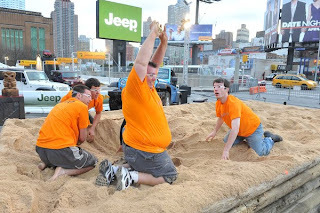 The first was a giant sand pit erected by the Jeep marketing team for a 7am five person dig to see who from Jeep’s Tweet-to-Win Twitter contest would find a small Tiki Idol and win a Jeep Wrangler Islander edition. 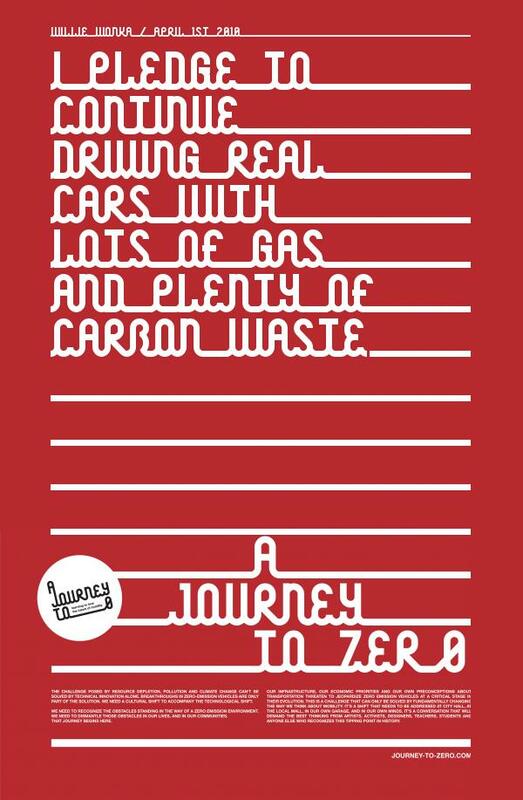 The other installation comes from the Nissan marketing team to promote their Journey to Zero website. 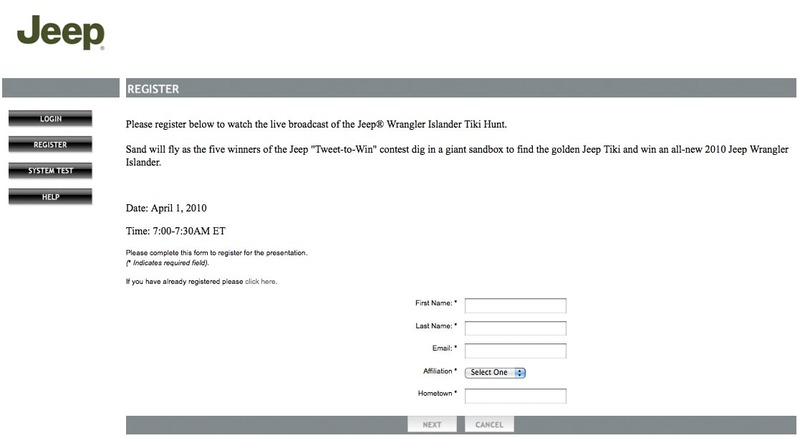 I decided to follow the Jeep contest thanks to a web link they provided to watch the event on a live web feed. Unfortunately, I had to create an account to view the feed and there was no chat offering, which has become pretty standard for live webcast events. Also, it was unclear how many people watched the live feed but at 7am and with few people at the live event, besides some media and a bunch of Jeep PR people it was probably a small gathering online too, not that any event like this attracts a lot of people for any brand. The video with the most views from the dig on Jeep’s YouTube channel had 80 views when I looked late this afternoon. Though, they did get some nice coverage from the Detroit Free Press and the Naples News too. The bigger news from Jeep is that this was the kickoff of their next giveaway. Mike Manley, President and CEO of the Jeep brand, mentioned at this morning’s event that Jeep is giving away three more Jeep Wrangler Islander Editions as they place three Tiki Idols in hidden spots across the United States. Tips to where they are will be made available through a site he said was live this morning, unfortunately the JeepTikiHunt.com site is still not live and I will continue to check it to see how the site is laid out and communicates the contest. So stay tuned for an update on that. Nissan, however, has their website live for the Journey to Zero marketing campaign. This is in alignment with Nissan’s coming LEAF all electric vehicle that is changing the mobility equation. Visitors can get to the LEAF U.S. and Japanese websites through the About section of this campaign site. The site features TED organizer and speaker Richard Saul Wurman. Content is all about a world with zero CO2 emissions and what that means to global environmental impact. This one completely missed my radar even though I’ve been to the Nissan LEAF website, I’m part of the email curriculum for the campaign, and belong to their Facebook and Twitter communities. I’m really not sure how one finds out about this effort and judging by the views on the campaign’s YouTube Channel, not many others found out about it either; though, a Fast Company blogger did. 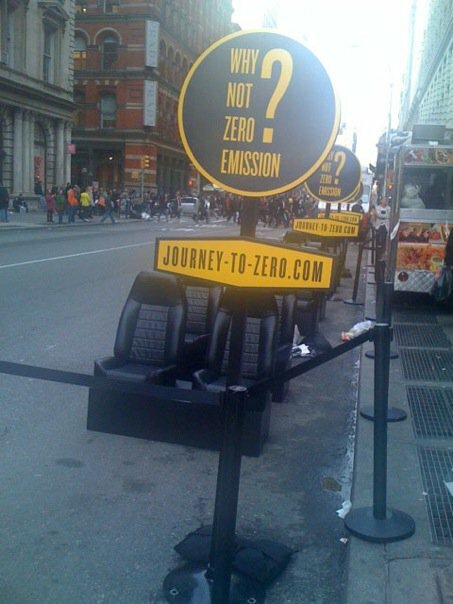 Perhaps more will get to know about it as they wonder the streets of New York where Nissan has several rows of front and back seats ironically lined on a city bike path with a sign promoting the Journey to Zero message. Looking at the web experience the campaign was probably marketed to niche creatives and greens who might have the patience to put up with the frustrating web experience that causes the page to float everywhere as one’s mouse is moved across the page. The navigation also is hard to use as it appears and disappears quickly if one doesn’t hold one’s mouse to the most left area of the page. Fortunately some people did take the time to use the site and even enter a contest called “Inspired by Zero” that had artists submit works to express the idea of zero emissions. Winners have already been chosen with prizing being a couple cameras and an Apple MacBook Pro. The site also features some social media outreach functionality allowing visitors to add flair to their Facebook pages or images to their Twitter profiles. 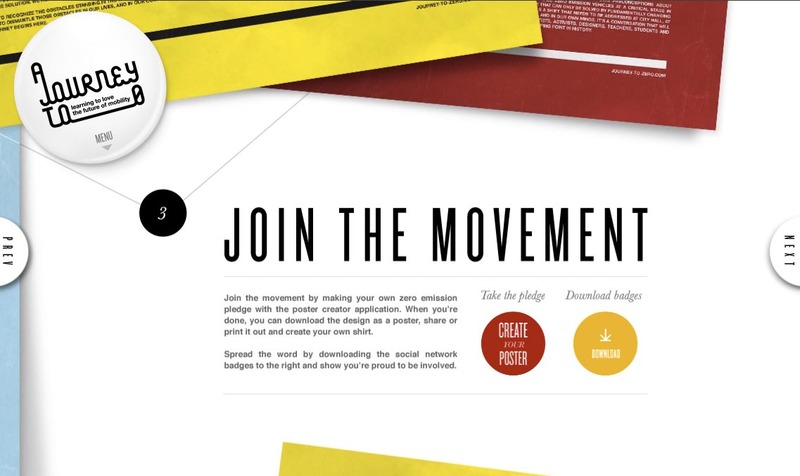 One can even create their own poster to save and email to all their friends. I wonder if anyone actually did any of this? It all goes back to consumer value and the site's social graffiti really doesn't have much of a benefit beyond promoting the Nissan site, which is really to Nissan's benefit not the site visitor's benefit. Seeing how little was done to promote this site it and the effort launched over three months ago without much fanfare, maybe Nissan is now trying to breathe some life into the effort on the trendy streets of New York City causing the hip the take notice of how the LEAF is environmentally acceptable for our world.